The 4-cylinder Sunbeam Alpine Series 1 sports car, launched in 1959, had gained a solid reputation for its comfort and handling, both on and off the track. However, in terms of performance, it was sadly lacking. Rootes realised that it needed more power, but did not have a suitable alternative engine. Since their financial position was deteriorating owing to crippling strikes, the idea of designing a new engine was out of the question. They therefore approached Ferrari to redesign the current engine since they felt that being associated with such a prestigious carmaker would have enormous benefits. Unfortunately, in the end, negotiations came to nothing. To complicate matters, in late 1962, the racing driver Jack Brabham had suggested adding a Ford V8 engine to the Alpine. Sadly, at that time, this idea fell on unsympathetic ears at Rootes. The concept of putting a large American engine into a small European car was not new, and had been accomplished with such models as the Nash-Healey and the Facel Vega. Indeed, the most successful of such marriages was when Carroll Shelby fitted a Ford V8 engine into an AC Ace sports car to produce the celebrated AC Cobra. Ian Garrad, a Rootes American Motors Manager, had found that most of the alternative engines he had considered were too large, and simply would not fit into the Alpine engine bay. The solution was found in the form of the 260 cubic inch Ford V8 engine used in the Ford Falcon saloon. 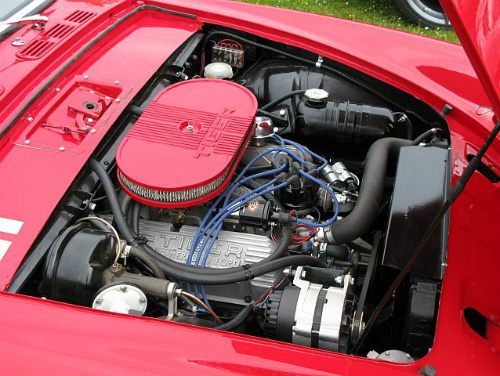 This unmodified engine developed 164 bhp at 4400 rpm, and offered considerable potential to increase the output by the addition of a four barrel carburettor, and modifying the intake manifold. Garrad then approached Carroll Shelby and Ken Miles, both legends on the racing circuits, who both agreed to work independently on the project. In May 1963, with a budget of $800, Miles was given an Alpine Series 2, a Ford Falcon engine, and a two speed automatic gearbox and produced a working V8 conversion in only a week. His prototype made use of a number of the Alpine's components, including the recirculation ball steering. The Shelby prototype was finally chosen, and was designated the name Thunderbolt. The Ford V8 engine was only 3.5 inches longer than the unit it replaced and, consequently, was a tight fit in the Alpine's engine bay. In July 1963, following 40,000 miles of testing, the Shelby prototype was shipped to the UK for Lord Rootes and his team to assess. As it turned out, he was so impressed that he immediately negotiated a deal for the supply of 3,000 Ford V8 engines, sufficient to cover the projected sales of the Thunderbolt for the first year. In order to accommodate the large V8 engine, the chassis and suspension were modified. Although this additional strengthening increased the overall weight of the car, the resulting power-to-weight ratio was still outstanding. Rootes Group then conducted their own development programme on the Thunderbolt in order to ensure that it was suitable for mass production. The interior of the car was very similar to that of the Alpine Series 5, upon which it was based. In 1926, Henry Seagrave established a world land speed record of 153 mph whilst driving a V12 racing car that he had commissioned from the Sunbeam Motor Company. 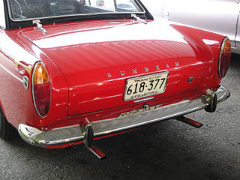 In honour of his achievement, the Thunderbolt was renamed the Sunbeam Tiger sports car. 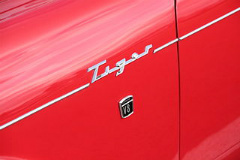 In essence, the Tiger was, initially, a Series 4, and ultimately, a Series 5 Sunbeam Alpine fitted with either a Ford 260 or 289 cubic inch, Windsor V8 engine. In April 1964, the Sunbeam Tiger sports car was launched at the New York Motor Show. With the Tiger in place, Sunbeam's competition was no longer MG's and Triumphs, as it had been with the Alpine but, instead, a move into the higher league of Jaguars and Corvettes. Automatic transmission was available as an optional extra. As standard equipment, the Tiger was fitted with a Ford twin choke (two barrel) carburettor. However, high performance optional equipment was made available through Sunbeam dealerships, in the same way as comparable kits were distributed through Ford dealers for owners of the Ford Mustang. With such equipment fitted, the V8 engine was now capable of developing anything up to 245 bhp. The stage was now set for the production of the Mark 1 Sunbeam Tiger sports car, which began in June 1964.